The torrential monsoon rains paralyzed India's financial capital Mumbai for a third day Thursday as the streets turned into rivers and people waded through waist-deep waters. According to the Times of India a 117-year-old building also collapsed in Mumbai early Thursday in the deluge leaving at least nine people dead and over 20 believed trapped. On Thursday morning rescue workers were looking for survivors. Surrounding houses were also damaged when the building collapsed. 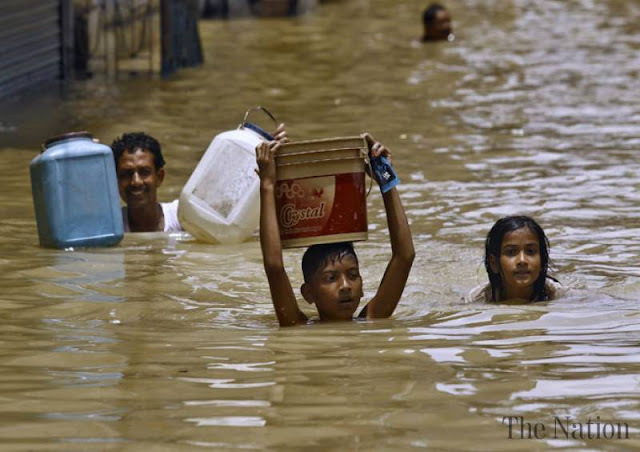 Local TV footage showed streets were already submerged as the country's meteorological department forecast that the rains would continue for three days in various parts of Sindh province, where authorities closed schools as a precaution. Windstorms and rain are also expected in the south-western Baluchistan and eastern Punjab provinces. The meteorological department said rains were also expected in the capital, Islamabad, and in Kashmir. One third of Bangladesh was believed to be underwater and in Nepal, where 150 people have died, the UN called it the worst flooding in a decade, the Guardian reported.